This set contains 20 High Speed Steel Twist Drills with a Metric Size Index. The Drill sizes included are 0.3, 0.35, 0.4, 0.45, 0.5, 0.55, 0.6, 0.65, 0.7, 0.75, 0.8, 0.85, 0.9, 0.95, 1.0, 1.2, 1.3, 1.4, 1.5, 1.6 mm. 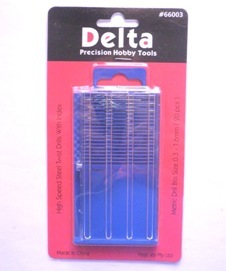 The drill set comes in a hard plastic case with a clear sliding cover.